Isn’t Hannah absolutely stunning?! Hannah is a draft horse friend of ours from The Flying R Ranch. She is in a custom SpecTACKular Halter Bridle and our Purely Beta Loop Reins with Popper. Want to order some holiday colors for your festive equine or horse lover in your house? Visit us and put in your order, or if you’re not sure what your pal or gal wants? Gift certificates!! 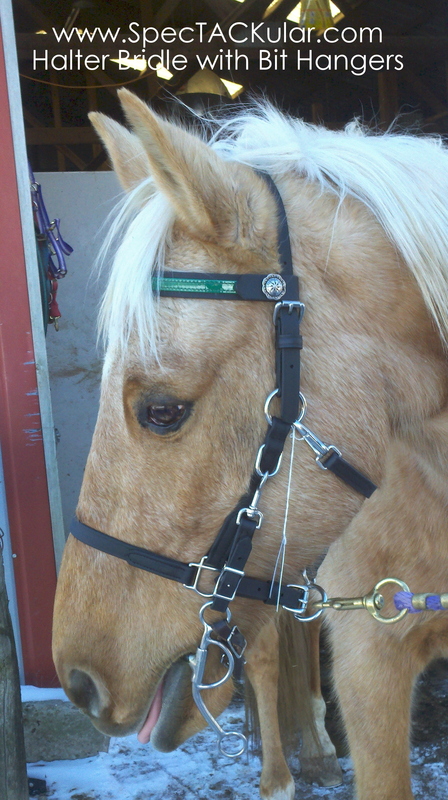 If you have ever used a Halter Bridle you already know you love it. Horse Tack made simple and with easy care BioThane. The ease of catching your horse, then tying up, grooming and then ultimately riding with one simple product is a wonderful convenience. At a lunch break? Need your halter on to tie safely? No worries, the halter is already on your horse. No need to pack a rope halter. Nor wear an old web-halter under your bridle. Or risk your horses’ mouth by tying up to the bit. With our Halter Bridles, you simple attach (or detach) the bit to the Halter. A Halter Bridle is really that simple. 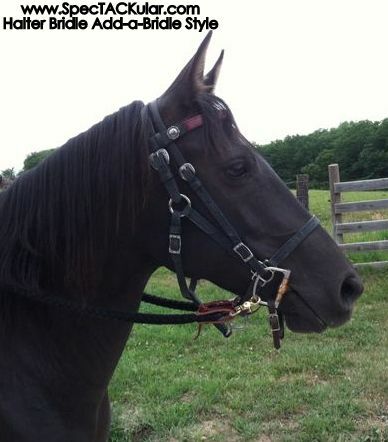 There are two common types of Halter Bridles. Which one is right for you? The Halter part on both styles is the same; except the halter on the bit hanger style has two elongated “D” rings sewn-in for the bit hangers to snap into. The biggest difference in the two styles is the way you attach the bit to the Halter when you are ready to ride. The Add-a-Bridle style is an entirely adjustable strap that holds the bit. The bit goes into the mouth; the add-a-bridle strap goes up & over the ears, then rests on the poll behind the ears like a traditional bridle. Our Changeable Browband then snaps-around the Halter & Add-a-Bridle. The Bit Hanger style is two individual “bit hangers”. The bit is held on one end and a snap is on the opposite end of each bit hanger strap. When you are ready to ride, you put the bit into the horses’ mouth. The bit hanger snaps into the elongated D Rings on each side of the halter. The Changeable Browband snaps onto the Halter poll strap and there is only one strap behind the ears / poll. The Add-a-Bridle is best if your horse is a “wiggle worm” when you bit up. It attaches more like a traditional bridle. In the mouth, up & over the ears. Therefore the Add-a-Bridle style bit attachment is very easy to get used to if you are new to riding with a Halter Bridle. We make the easiest to attach Halter Bridle Bit Hanger Style in the industry (Elongated D rings, no buckle interference & thumb touch snaps) yet some with small hands or arthritic hands still find a Halter Bridle with Bit Hanger style harder to attach. Both styles have adjustability at the bit however the Add-a-bridle also has adjustability at the cheek. Our Changeable Browbands completely detach with a snap on either style for easy grooming. In the end – its personal preference & rider style. I have small hands and luckily a horse that holds still & takes her bit easily. I ride with the Bit Hanger Style because I like the cleaner look of one less strap. Also, I’m short so attaching/detaching the bit at the cheek is easier for me, then having her lower her head to go behind her ears. Plus, I’ve just gotten used to using a Halter Bridle with Bit Hangers – habit. Yet, the Add-a-Bridle style is our most popular. All of our products are made from easy care Genuine BioThane and Stainless Steel Hardware. Hope this explains & helps you decide which is right for you. Tack Girl Tip – If you use multiple bits. Order extra bit hangers or an extra Add-a-Bridle. One for each bit. You can use these with the same Halter Bridle. We have been enjoying a weekly radio show called Better Horses. Its a one hour show devoted to horses. Training Tips, Tack Tips and since its sponsored by Purina Mills, nutrition tips. It is hosted by Ernie Rodina & Dawn Dawson who are very enthusiastic. We also got to participate on the show with Ernie & Dawn. It was a hoot! We chatted all about SpecTACKular’s spectacular BioThane Horse Tack. If you missed it you can listen to the archive of the show. Our chat on BioThane can be found on The September 22-23, 2012 Episode, beginning at the 17 minute mark. Listen up and hopefully we might even be invited back someday. With a few friends guidance, I tied my first horse camp tie post a few weeks ago. Once again, I appreciated their years of horse camping experience. If left to my own devices, I would have set my lead rope length at the same longer distance as a High-line. 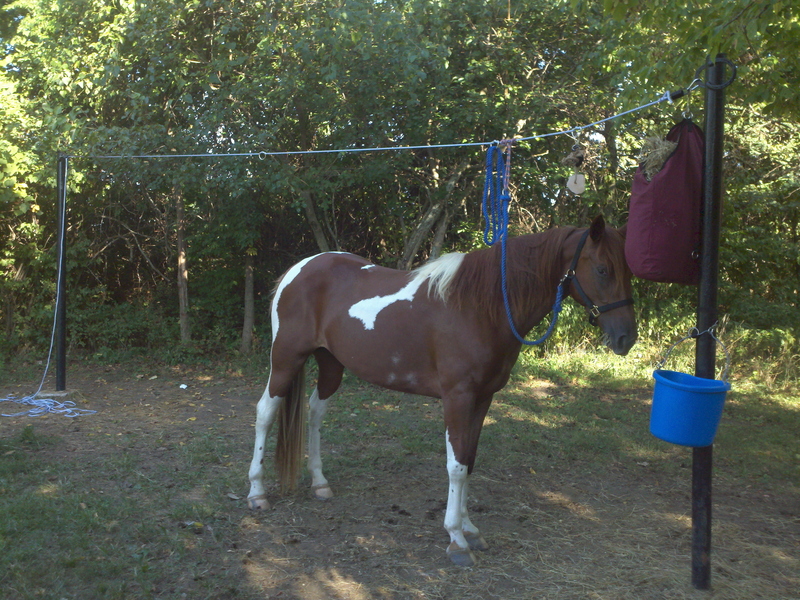 I quickly learned the differences between the two common types of horse containment in a horse camp. 2. Tie longer on the high line – Nose touching the 3″ ground is the length as a rule that I was taught. Of course the high line has some flex too. A tie-post has no flex. 3. The difference? – Both are “safe” for a trained, mature horse. But on a Tie Post the horse can not lay down. This is meaningful for your horse’s comfort, especially if you are riding a lot & on a multi-day trip. Your horse naturally will lay-down 4 hours a day and particularly needs this opportunity when working hard. At this campground, first arrivals have a choice of sites and horse accommodations. I will choose a high-line going forward, if available. And if a high line is not available, at least now, I know how to tie safely at the correct length on a tie-post. 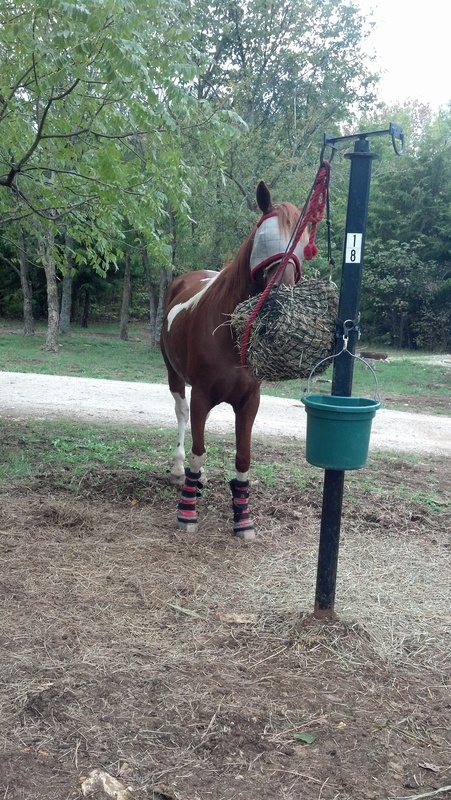 Tack Girl Tip – I take photos of my horse containment set ups in a horse camp. I print and keep the photos in my horse trailer. When I arrive at a horse camp, I have a visual reference to replicate. Bonus – The photos show a “tied” water bucket so you do not have to set a bucket on the ground. No tip over due to pawing. Tie-Post or High-Line: Which is your preference? 1. Wash ‘n wear – Dunk it in a bucket of soapy water or just hose it off. It’s that easy. 2. Maintenance free care – No lotions, No Potions are ever required. BioThane will not dry rot or crack. 3. Weatherproof – It does not get stiff in the cold, or gooey in warm weather. Not every horseback ride is on a sunny 70 degree day. 4. Waterproof – Cross a river, or get caught in the rain with one less concern. We heat seal every hole to assure our finished product remains waterproof. 5. Antimicrobial – Won’t absorb your horse’s blood, sweat, tears & germs. Or their odor. 6. Chafe-Free – It will not rub on your horses sensitive skin. 7. Carefree – Will never mildew, mold or dry rot. Go ahead; keep it in your horse trailer or barn year round. I am a horseback rider too and at SpecTACKular we love our BioThane. And…With these advantages over Leather Tack it was a “no-brainer” when we selected the quality materials to create our horse tack from. It is spectacular & SpecTACKular. Have you ever seen or felt BioThane Beta horse tack? Do you agree it’s an amazing material? Are Single Strap Breast Collars for the Trail?. via Are Single Strap Breast Collars for the Trail?. Is this trendy new trail tack style really for trail riders or just the show ring? We first encountered this style of breast collar (Single Strap Breast Collar) at a Smokin the Trails ride in Deam’s Lake, Indiana. All of the fast-moving Speed Racking horse crowd seemed to be sporting them. We instantly loved the clean, simple look on the horse. Sometimes, less is more. 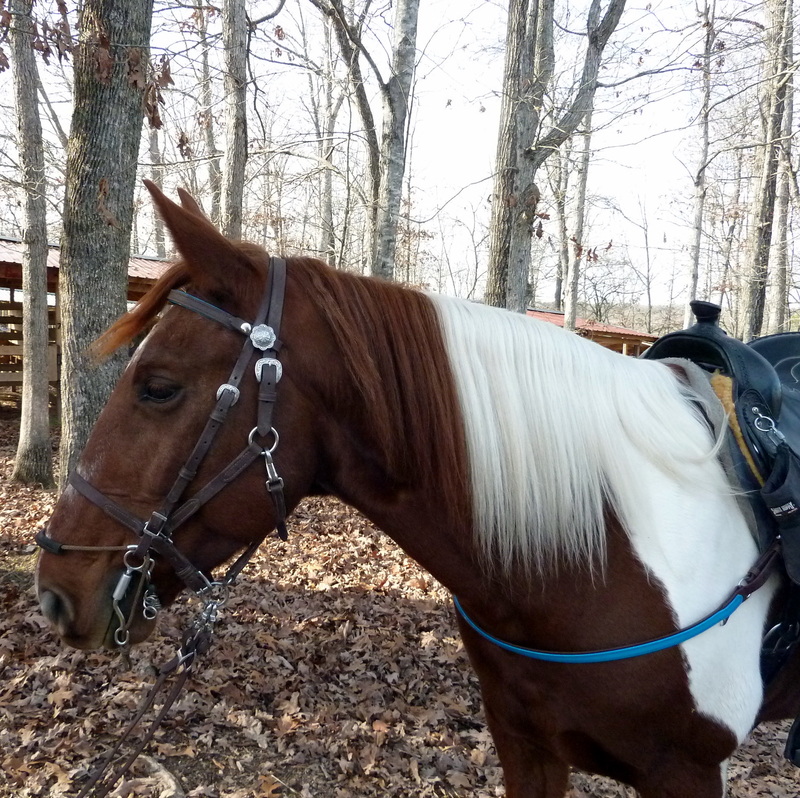 However, we frequently ride in the very hilly Ozark Mountains of Arkansas & Missouri. Breast Collars aren’t an option…. they are a requirement to assure your saddle does not slip back going up a steep incline. I was accustomed to horseback riding in a more traditional “Endurance-Style” or “Off-the-Shoulder Style” Breast Collar with a Breast Collar ring and a strap attaching to my girth. Would the Single Strap Breast Collar ride-up & choke the horse on a climb? Would it stay off-of-the shoulders on the trail? We had to know. When we returned from the Smokin the Trails ride, we sat down at the design table. The Single Strap Breast Collars we had seen on the Speed Rackers were made of leather with a vinyl wrapping for color. Very impractical materials for trail riders that encounter mud, water, dirt & sweat. So, of course, we wanted our design to be “SpecTACKular” and made of BioThane (Beta) with beautiful Horse Shoe Brand stainless steel hardware for easy care & strength. We also wanted to be sure that we used our Strategic Stitching to prevent rubbing on the horse. The first Single Strap Breast Collars arrived in Fall 2011. We began field testing the new design (Our code for an excuse to ride our horses more). They are awesome! Even on steep inclines, our saddles stayed in place. When properly fit, the Single Strap just floats on the horses chest with no interference of the horses shoulder movement. 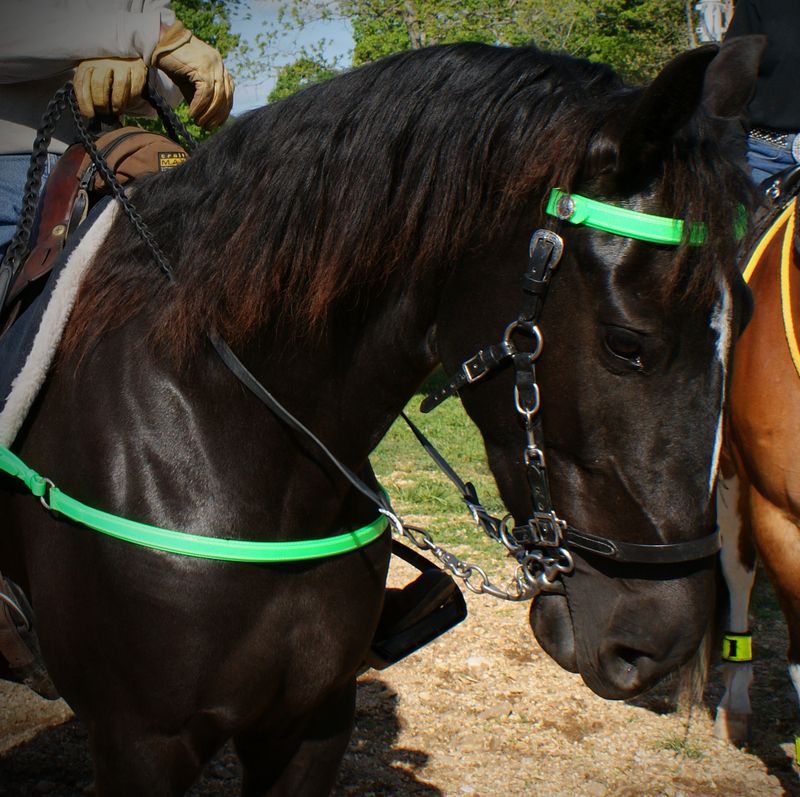 Yes, the Single Strap Breast Collars are for Trail Riders and many other types of horseback riders too. The simple look comes Black & Browns to match your saddle. Or have fun, the Single Strap Breast Collars are available in over 30 color combos. A Chocolate Brown Beta with a Turquoise Overlay (Shown). Black Beta with a gloss red overlay. Or Make a Splash with glossy BioThane Bright Green or add Crystal Spots in every color of the rainbow. Fashionistas – You can even add a Changeable Browband on your Bridle for the coordinated look. All in easy care BioThane. All with Stainless Steel Hardware. All with our Lifetime Warranty. We believe this trendy new breast collar style is here to stay. What do you think? Labor Day Events – Come visit with us! At The Flying R Ranch in West Plains, MO http://goo.gl/Lha3P They have Demo Tack for Ranch Guests. Ever wanted to demo a set of our Hand Grip Braided Reins, a Breast Collar, A Halter Bridle? This is your chance if you’re a ranch guest. Demo our product on an actual TRAIL RIDE.They have a lot of our SpecTACKular Horse Tack on Hand for sale; can do a “Get Fit Measurement” and Katie can help you select from bazillion of color combos. Katie is amazing, she knows about every discipline of riding & use to make tack. Talk about experience! 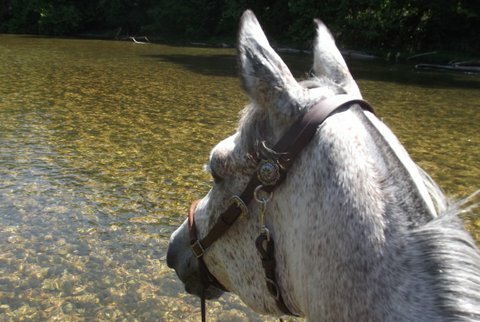 Iron Mountain Horse Camp in Ivanhoe, MO http://goo.gl/3Gueo Yep we are returning to this gorgeous region of Southwestern, VA. Kim has NEW inventory on-hand in COLORS. Including a Gloss Black & Red Combo that is just what the Fashionistas are calling for this season. Kim is trained to Measure your Horse the “Get-Fit” way. She has an eye for color and knows horses. Stop by to see her at Iron Mountain Horse Camp! She’ll be there for a week! Shelton’s Big Flat Get Away in AR http://goo.gl/1pgfE . Near the BuffaloRiverNational Park. We’ll have products displayed & ready to sell each evening after our ride. Worth the drive as our primary designer will be on site. She has an expert eye for all things horse, especially trail tack. What’s the right color for a Palomino or a buckskin? She just knows and can help you design something special. You will be “Riding with Pride” – Promise! 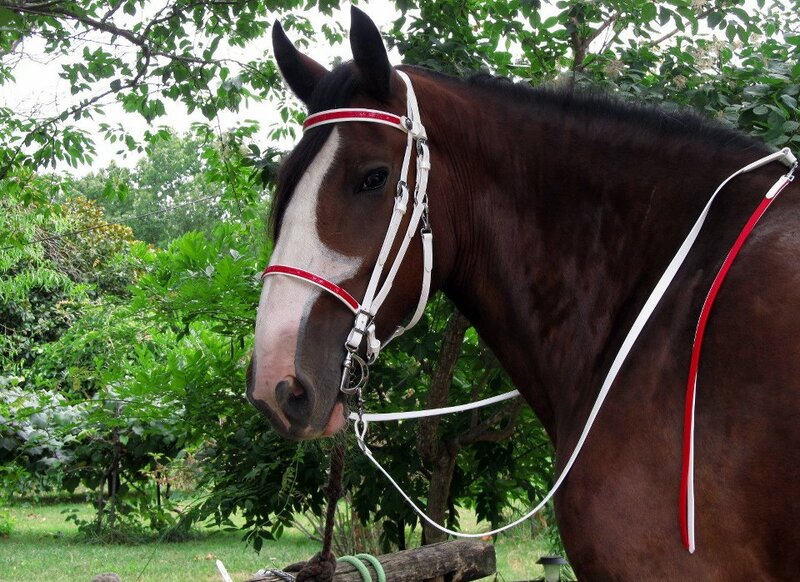 You can see our trendy Single Strap Breast Collars and lots of colors on her horses. Hope everybody has fun ride plans for the week-end. Where are you riding? Love to hear about it.